Introduced in 1947 by Hormel Foods, SPAM is a canned meat product billed as pork and ham and made mostly from pork shoulder. But, of course you already knew that since I’ve never met anyone who hasn’t eaten or made fun of someone who eats SPAM. 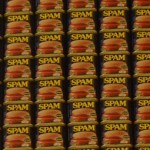 In fact, 99% of the supermarkets in the United States carry SPAM and it is distributed in 41 counties worldwide. That’s A LOT of pork and ham. If you’re not lucky enough to have eaten one of the 240 cans that were consumed in the last minute (seriously – 3.8 cans a second! ), I’d highly recommend that you buy an individually wrapped single, fry it up in a pan and have a taste. This semi-permeable gelatinous meat product will either make you fall in love with its affordable price and meat-like taste or make you seriously consider vegetarianism. You should rinse your palette and repeat with all the available flavors – like Turkey SPAM, SPAM Lite, Bacon SPAM and so many. Regardless of your reaction, SPAM is an American phenomenon you simply cannot deny. It has innumerable fans and just as many critics. It has inspired festivals and cooking contests and even its own Broadway show (SPAMalot). We’re also pretty sure that it’s the only canned meat to have its own museum. And, today we visited that museum in Austin, MN, and it actually exceeded our expectations. As we entered, we were greeted by Jim, a long-time Hormel employee who retired in 1996 and became a SPAMbassador almost a decade ago (SPAMbassador is my term “copyright!”, but Hormel can use that for $100, or the equivalent in SPAM store credit.) He encouraged us to turn around to see the nearly 4,000 cans that make up the Great Wall of SPAM, then gave us a few tips on our next few days in Ely and kindly took our photo with SPAMMY, the chunky mascot statue. We then went into theater to watch “SPAM: A Love Story” which chronicles the spiced ham (and pork)’s history, media appearances, and fans. From there, we visited exhibits about the Hormel family, saw a puppet show, learned about SPAM’s role in WWII, the Hormel Girls and even SPAM’s distinctive can. Victoria even auditioned for a job at the canning factory – with a very respectable time – before we tested our knowledge on the interactive game show – The SPAM Exam. Unfortunately, we had to leave after the fourth of ten questions because the child of a competing contestant was compounding our hunger agitation. Better to get lunch than scold the parent. We rushed to gift shop and purchased some souvenirs and gifts for friends and we were off to Jerry’s Other Place Restaurant for the SPAM Museum Special – a SPAM burger with cheddar cheese on toasted bun. It was a very SPAMazing day, and we would say, this is a MUST see if you’re in Southern Minnesota. See pictures below, and click here for more information. did you buy some spam for the road? Absolutely, though, I cannot enjoy it. I just can’t… it’s sooo… ugh.